Why the Happy Office Works Better! In a recent piece in Forbes, Ingrid Fetell Lee, an industrial designer and author of the book, Joyful: The Surprising Power of Ordinary Things to Create Extraordinary Happiness, argues that office design, and fit out can be an extremely effective tool for communicating an organisation’s values. What does your office say about your company? Every organisation should have a clear vision and strategy that can be expressed in office design, layout and fit out. Many different elements go into creating a particular mood and tone for office space including colours, textures, spatial layout, facilities and work areas. Formal offices communicate a formal culture; informal offices communicate a more casual, playful atmosphere. This is important for reinforcing brand identity and for attracting clients and the right talent. But it is also important for grounding employees and providing them with a sense of belonging. How can you improve your workplace to promote happiness? The answer is not just free snacks, beanbags and ping pong tables, although sometimes these perks have a place. What makes then a happy office? Providing employees with choices is key to increasing office happiness. Increasing overall comfort levels can be accomplished in a variety of ways by recognising that individuals have different needs and ways of working. Adequate bathroom facilities taking into consideration gender distribution. Setting standards or rules for acceptable personalisation in work areas can help to maintain a clean corporate identity while giving employees the ability to make their workspaces friendlier and homier by including small decorative items or personal photos. One of the most regularly voiced complaints about open-plan offices is the level of distracting noise. Reducing the overall ambient noise levels in the office as well as cutting down on distractions in open areas can help to reduce worker stress and fatigue. Interior fit out based on sustainable principles delivers the greatest positive impacts on the health of building and office occupants. Green materials, for example, emit-less VoC. Paints, floorings and wall treatments are non-toxic and less likely to cause allergies or discomfort (associated with “sick building syndrome”.) At the same time, maintaining general hygiene and cleanliness becomes easier when using sustainable materials. During an office fit out use sustainable and non-toxic materials – that are easy to clean and maintain, and which help to improve indoor air quality. High fit out standards must be applied in installing or refitting HVAC systems, ducting, plumbing, and so on. This has the added benefits of cutting down on cooling costs, and the need for costly repairs from sub-par systems. Good ventilation prevents the spread of illness in closed environments. General office cleanliness is a must using scent-free and chemical-free cleaning products. Encouraging tidy office habits, such as clean desks, and eating and drinking only in designated areas. Establishing processes and incentives for reducing energy and water consumption, recycling and safe disposal of possibly toxic materials, like batteries. 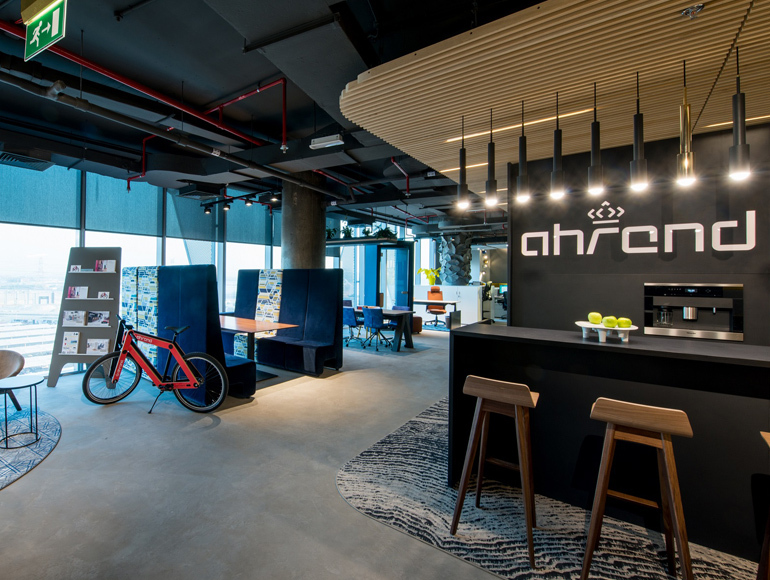 For Ahrend’s GCC “flagship” workspace the strictest sustainability standards were employed in office design and fit out. Green materials were used throughout, enhancing a bright, modern aesthetic highlighting signature pieces from Ahrend’s collection. The space was structured based on “Activity Based Working” including quiet areas, collaboration spaces, private call zones, video conferencing, “hot desks” and a coffee bar hub for informal meetings. Sitting down for long periods in front of a computer screen is one of the least healthy habits of 21st century employees. Encouraging workers to step away from their desks and to move is correspondingly one of the best things to do for both physical and emotional well-being. Instituting Office Wellness programs featuring health checks, sports or fitness challenges, and even corporate gym membership plans. 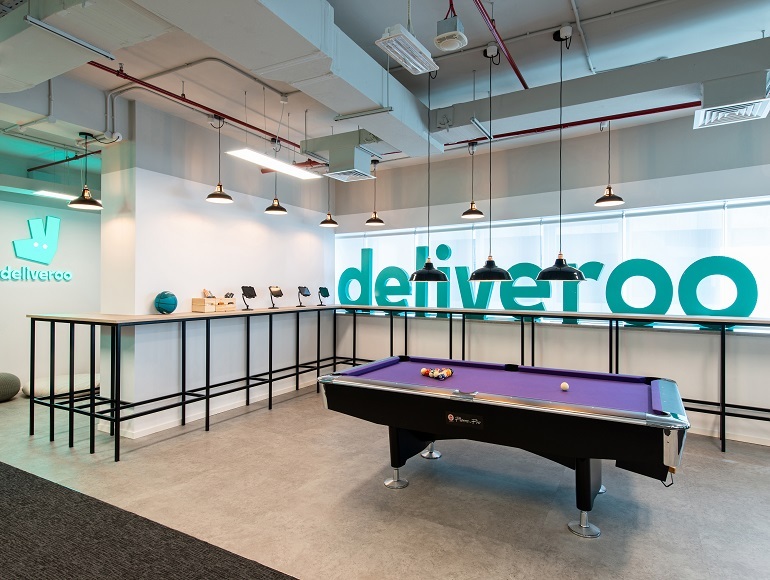 For example, the fit out of food delivery start-up Deliveroo included a large dedicated portion of their working space for a flexible pantry, meeting and recreation area. Biophilia is one of the most significant trends in contemporary office fit out. Numerous studies have demonstrated that exposure to elements drawn from the natural environment, like sunlight, plants and natural materials all contribute to creating a better mood and increasing worker performance. Integrating more natural materials into office design and fit out including wood, stone, hemp, rope etc. Incorporating the latest technology into a new office fit out is key – the benefits include reducing unnecessary effort and to free workers from the constraints of repetitive and unrewarding routine. But hiccups and bugs associated with different technological innovations can also be one of the most frustrating aspects of office life. Finding the balance means providing a 21st century hassle-free digital experience that fosters connection rather than disconnection. 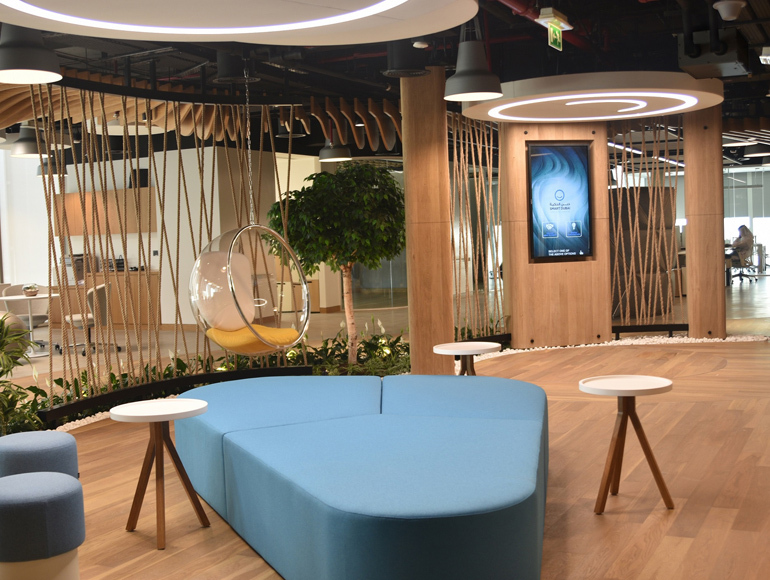 For our Smart Dubai Office fit out project the focus was not only on providing attractive and inviting working spaces, including pantries and recreation areas, most importantly was the installation of the latest technological innovations to facilitate a seamless workplace. At Summertown, our vision of sustainable fit out involves everything that contributes to creating better workplaces and that includes the health, well-being and happiness of office occupants. We have extensive hands-on experience in implementing sustainable fit out solutions for a wide variety of leading companies. In our own LEED (Leadership in Energy and Environmental Design) certified office, we have a comprehensive wellness and well-being program and we are committed to improving the health of our employees and their emotional and psychological well-being. We are proud to have been the first recipient of the inaugural 2017 Happiness @ Work Awards, which identifies organisations that create a positive atmosphere, happiness and a sense of belonging in the workplace. We are continuing our journey and are pursuing WELL certification for our office interiors – which is the premier building standard that focuses on enhancing people’s health and wellness through buildings. 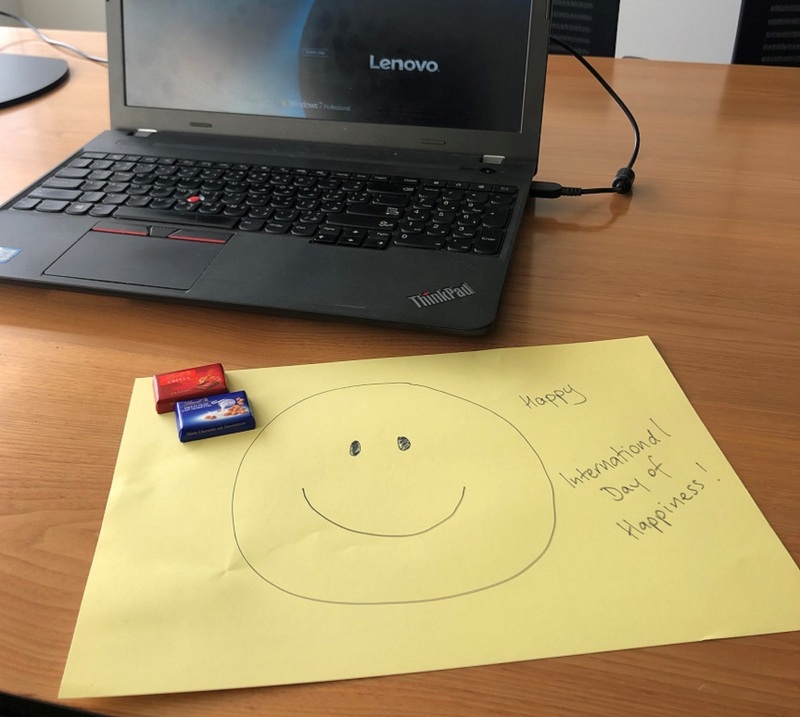 As we celebrate 2019’s International Day of Happiness, there is no better time to reflect on how we can make the world a better place while helping our employees become happier and more productive. Reach out to us today to discuss what steps you can take to transform and improve your workspace.